The döner kebab is such an iconic Turkish street snack, but in fact it was invented in Berlin! It really was! Mehmet Aygün, who had just moved to Germany, created the döner kebab in 1971 – wrapping the kebab meat in a pitta instead of serving it with rice. Unfortunately, the ‘king of kebab’ is no longer with us but his Berlin restaurant chain Hasir is still serving the tastiest döners in town! In Istanbul, the best döner kebab can be found right next to the Grand Bazaar, at Dönerci Şahin Usta. I’m using chicken meat instead of the traditional lamb or veal and am roasting it in the oven. You can watch me make this chicken döner kebab in my second Istanbul episode. Start marinating the meat the night before. Mix all the marinade ingredients in a bowl, add the deboned chicken thighs and rub the marinade into the meat, making sure it is evenly coated. Cover the bowl with cling film and refrigerate for at least 4 hours or overnight. The next day, preheat the oven to 200°C. Thread the chicken thighs onto two metal skewers, so that the two skewers go through each piece of meat and hold it firmly in place. Push down the chicken thighs against each other so they’re tightly packed. Place the meat kebab onto a wire rack over a roasting tin. This allows the meat to dry-roast and the roasting tin below catches the juices. Cook for 45 minutes, turning the kebab over halfway through. Meanwhile, prepare the mayonnaise by mixing all the ingredients together in a bowl. Refrigerate until needed. Once the meat is cooked, take out of the oven and cover with tin foil. Leave to rest for 15 minutes before slicing. Meanwhile, slice each pitta in half and microwave for 30 seconds. Open the pitta pockets and stuff them with a bit of chopped salad, tomato and onion. 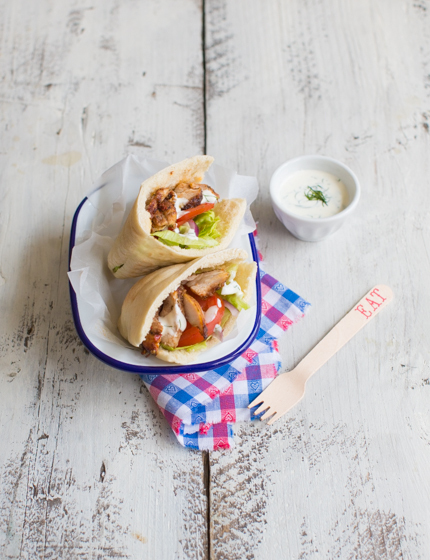 Slice strips off the chicken kebab and stuff into the pittas. Drizzle with the dill mayonnaise. 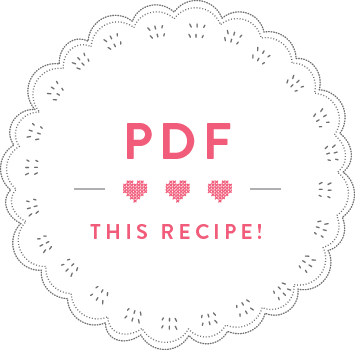 • If you can’t find deboned chicken thighs at the supermarket, you can ask your butcher to debone them for you. • You can prepare the meat on a barbecue using indirect heat: light the barbecue and let the flames die down. Once the charcoal turn ashen, push them to one side of the barbecue. Place the chicken kebab onto the side of the barbecue with no charcoal underneath it and grill for 45 minutes, turning regularly. To check whether the meat is done, pull two chicken pieces from the centre apart and take a peek inside.